Banana bread has been homemade in our family for years. When I was younger, my Mom would make it on a regular basis. And when it comes fresh out of the oven … heaven. In our house, brown bananas were never tossed. Instead, they were appreciated for the sweet moist flavor they give to the bread. 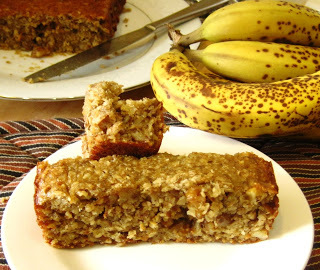 As I became a Mom, I started baking banana bread for my kids and they still treasure the memory. So, I put my thinking cap on to create a Stay Healthy version of this family tradition. And this is the result. The combination of ingredients in this recipe lacks for nothing. It is absolutely FABULOUS in flavor, texture and nutrients. Plus, it makes a perfect breakfast or snack. Preheat oven to 350 degrees. First, grab an egg and measure out the coconut oil so that they can be coming to room temperature. Coconut oil will solidify if allowed to cool and not mix well in the recipe. If necessary, heat the coconut oil until very soft or liquid (this will take seconds). Prepare a loaf pan with cooking spray and dust with flour to prevent sticking. Set aside. In the bowl of an electric mixer combine bananas, coconut oil, Stevia, egg and vanilla. Mix on slow and increase to medium speed until smooth and well blended. In another bowl, fork or whisk together the Oat flour, protein powder, baking soda and baking powder. Turn the mixer to low speed and slowly add the dry ingredients to the wet mixture and mix until all ingredients are combined. Stir in the chopped nuts. Pour batter into loaf pan. Bake for approx 30-35 minutes or until a knife in the center comes out clean. Do you think i can make it without the Whey Protein? Doesn’t that change the texture ? If it changes it, what can i use to replace it please? Thanks for stopping by my Stay Healthy recipes. Yes, omit altogether and I do this all the time. I increase the oat flour or add ground flax meal. The texture turns out fabulous. Stay Healthy!